FOUR PAWS moved 47 animals out of Rafah Zoo in Gaza and transferred them to wildlife sanctuaries in Jordan and South Africa. International veterinary charity FOUR PAWS has successfully completed its biggest rescue mission to date. On Sunday (7 April) the rescue team moved 47 animals out of Rafah Zoo in Gaza and transferred them to wildlife sanctuaries in Jordan and South Africa. The mission was due to take place at the end of March but had to be postponed owing to ongoing unrest in the region. FOUR PAWS vet and head of mission Amir Khalil said: “The intensive work of the last weeks has brought our team to its limits. To examine and load almost 50 animals in just a few days was a huge challenge. The rescue team arrived in Gaza on 4 April and spent four days finalising the negotiations and logistics of transferring the animals. Once the animals had been loaded into their transport crates, they embarked on their 300-kilometre journey to Jordan. 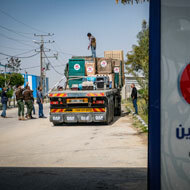 On arrival at the Erez border, the crates had to be unloaded and loaded onto a new truck in the Israel-Gaza barrier. Four Paws continued their journey, flanked by the Israeli army, and arrived at the wildlife sanctuaries in Jordan later that evening. The animals, including five lions, a hyena, several monkeys, wolves, porcupines, foxes, cats, dogs, emus, ostriches and squirrels, have been released into their new species-appropriate enclosures. Two older lions have been flown to their final home in South Africa, where they will live at the FOUR PAWS big cat rescue refuge LIONSROCK. Having been active in Gaza since 2014, FOUR PAWS has already evacuated and closed two zoos – Al-Bisan Zoo and Khan Younis Zoo – in the region. After the rescue of the Rafah zoo animals, there are only two more zoos left in the Gaza Strip. Image (C) FOUR PAWS/Bogdan Baraghin.